Come spend a magical day with us in the Sherwood Forest! 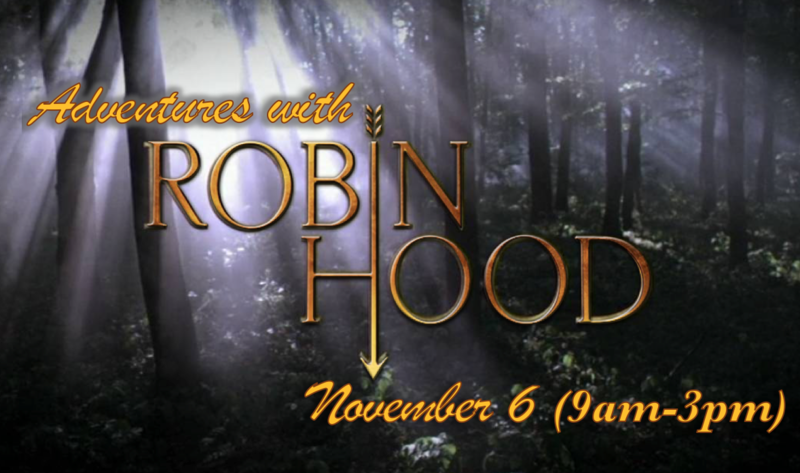 In this memorable one-day event, Heritage’s awarding-wining theatre department will take you behind the scenes of our upcoming Fall Play, Robin Hood. Learn about medieval music with the Troubadours, dance with the Blue Boar patrons, get your face painted by our artisans, wield a (prop) sword with the Merry Band and much more. We can't wait to have your child/ren spend the LCPS holiday with us! Registration is open to the first 50 students who register and submit payment. Sign-up is completed on a first-come, first served basis. Our spots fill up quickly, so act fast! The Director shall meet the parents and their students before and after the event in the designated meeting place (the HHS lobby). If your child is sick and cannot be in attendance or in the event of an emergency, please email heritagerisingstar@gmail.com. Parents and students should communicate with Heritage High School Drama Booster Staff by heritagerisingstar@gmail.com or heritagedramaboosters@gmail.com. No personal emails or cell phone numbers will be distributed to anyone outside the immediate adult staff. Cancellations made by HHSDBA due to weather or other emergency issues will be announced on our website as well as in emails sent directly to all families enrolled. In the event of a cancellation, information about a possible make-up class will be shared by the instructor/director. In the event of insufficient enrollment, a full refund will be given. Registration is a commitment to paying the entire fee. If the student/participant drops out prior to the start of a event, for any reason, the amount paid may be applied towards a future program. All fees are non-refundable. No exceptions. All withdraws (dropouts) must be made in writing at least one (1) week prior to the start of the program, in order for payments to be transferred to another program. No exceptions. Only paid in full accounts are eligible to be applied to a new program. Students must bring a non-perishable lunch and any additional snacks for each day of the event. Food is not included in the program tuition. After collecting information about student allergies, additional requests may be made. The Heritage High School Drama Boosters is an independent, registered 501(c)3. HHSDBA holds it's own insurance policy and is not an entity of Loudoun County Public Schools, but rather independently supports the needs of Heritage High School Theatre. As a result, HHSDBA will not have access to any child's IEP or HCP per federal HIPPA and FERPA regulations. HHSDBA has been granted permission to use the facility by HHS Administration. However, we welcome every child. Our Director is CPR/AED trained. You may work with the Director to create a plan and environment where your child excels and succeeds! Contact heritagerisingstar@gmail.com with any additional requests. By submitting this form, I grant permission for any and all photographs or videos taken at HHS Rising Star Day Program to be used by HHSDBA in displays or for advertising in, but not limited to, newspapers, magazines, newsletters, and brochures. I understand that no personal information will be associated with any photographs or videos without my prior written consent and that no compensation is offered. Being the parent/legal guardian of the student I am registering, I declare that the information and medical details on this form are correct to the best of my knowledge and I hereby apply for a space at the Heritage High School Drama Boosters’ Rising Star Day Program indicated for my child or ward. I understand that HHSDBA, reserves the right to restrict admission at its own discretion.